Pink Penguin: Popsicles Pattern at superbuzzy!! Hello everyone! Remember me? It's Ayumi of Pink Penguin here! How have you been? If you are in the US, did you get to do something to celebrate the Fourth of July? (I miss the sound of people screaming for joy and the fireworks from everywhere!) It's been so Hot and Humid here in Japan. What's keeping me alive and not melting away is my daily intake of popsicles. I looove them so much, and Joe hates how much I eat them in the day. However much Joe says it is excessive, I have a special place for popsicles in my heart and stomach. I am not going to resist therm if I know they are waiting for me in the freezer, hehe! We will be offering you one block pattern a month starting this month! All blocks are to put together to make a quilt in the end! Yes, so this is basically a quilt-along! Would you let me call it "Super Penguin Quilt Along" or "SP QAL"?? 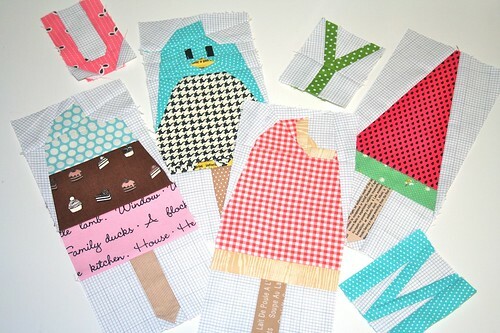 I knew I'd want my first paper pieced block pattern to be popsicles! Not simply that I am a popsicle addict, but that I can highly recommend this pattern for anyone with any level of sewing experience. All four popsicles, except for the penguin one, are very simply constructed so I say they are very friendly to newbies. The penguin one is for anyone up for a challenge ;) If you are new to paper-piecing and want to save heartaches, I suggest you skip the penguin and make the watermelon one instead, which is super easy peasy but is equally fun! Speaking of the watermelon popsicle, it looks like this in real life. It is very popular among kids in Japan and shows up everywhere during the summer. When Kelly suggested I include this one for our July block, I found myself questioning her "But don't you think folks will find it weird?" And then I realized it couldn't possibly be weirder than the penguin popsicle that doesn't even exist!! LOL! All popsicles are finished at the same size, so if you are following along the QAL, pick three of your favorite and put them together, which will be your July block. Three watermelon bars? Three penguins? Two napoleons and one chocolate? Whatever you like! The theme of the quilt along is most likely going to stick with "sweets", but we would love any suggestions or ideas if you have any!! 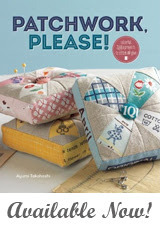 If you just want to try out one or a few patterns only to incorporate into your other projects along the way or maybe just want to try out paper piecing for a little bit or whatever, that would be completely fine too! We'd be just grateful if anyone could discover the joy of paper-piecing from our patterns! For anyone who is a neighbor to her shop (in Ventura, California, USA), we would LOVE to invite you to a monthly class Kelly offers there ;) I am unfortunately not very close (I WISH!! ), so I just have to imagine myself being there meeting crafty people and having tons of paper-piecing fun. Oh can you imagine how excited I was to find out when the first class for this QAL is going to be held? It will be July 22nd (1pm - 4pm). That is, July 23rd (5am - 8am) in Japan, the morning of my 30th birthday!!!! So I'll wake up thinking about the people playing with my block pattern with Kelly. I already know I'll have a great birthday!! Could I show you my friends' lovely work?? This was pieced by the awesome Doe! It's hard to believe this, but this is her first time trying out paper-piecing! How could that be possible??? 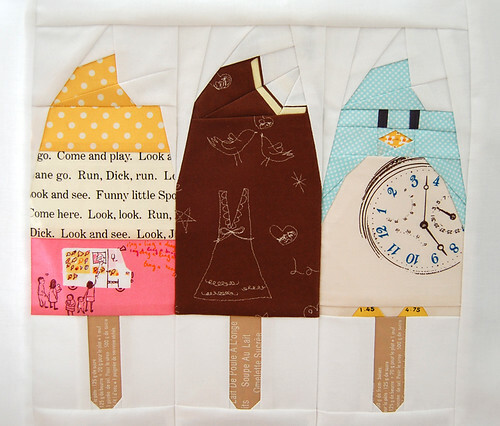 And this is my lovely real life crafty friend Tamiko's popsicles that will turn into a pillow soon!! Seeing these made me teary for joy! Thank you so much Doe and Tamiko for letting me share your yummy popsicles here! If you have any question, please go ahead and leave it in the comment so I'll reply directly there as it's likely there are other people who have the same questions. Thank you for allowing me to talk a bit! It's always nice to be back! I'll be back very soon!! This is adorable!! I need to try this one!! Thank you!! Ваши работы всегда так необычны и профессиональны очень красиво и цвета подобраны так здорово творческих Вам успехов!!! Great job! I have never tried paper piecing , might have to give it ago .. I love it, it's so funny! I live in Mallorca (Spain) and here is very hot and humid, are we going to eat some ice cream? Oh, Ayumi, you've outdone yourself yet again! These popsicles are so, so cute! 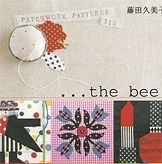 Doe and Tamiko's examples are awesome, and the fact that Doe could do so well at them when she'd never paper pieced before should give encouragement to others who haven't paper pieced. And it's helpful that you explained the penguin is harder than the others. Love, love, love that we now have a Super Penguin Quilt Along!!!! Oh my goodness! That is a fabulous idea! I adore all your paper pieces. I will definitely be quilting along. I can't wait! These Popsicles are adorable!! 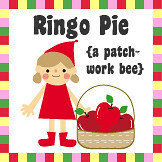 I have been wanting to give paper piecing a try so I think now is a great time to do that!! These are just so cute! Ayumi, they are fabulous! Congratulations on having them at Superbuzzy and for the QAL! I can't wait to see them all. Can you tell me if they can be foundation pieced as in the process of sewing through the paper or do they need to be pieced more like English paper piecing where you cut out the template pieces leaving a seam allowance and sew them together? Thank you so much Jennifer ;) I haven't decided on other blocks for the QAL but I've been thinking about it so much! So fun!! All of these popsicles as well as all my future blocks will be foundation pieced just like this juice block. It is such a great question, Jennifer! I think it will be very helpful if I take a picture of my printed PDFs on my next blogpost. Oh, these are just so delicous! I really would need few now because it's very hot also here in Crete. 22:00 in the evening and I have still air conditioning on even I don't usually use it much. I have been busy, too and missed your latest posts - wow you have so many beautiful sewings - yours and presents! I'm so excited - I just placed my order at Super Buzzy!! You + Super Buzzy = Happiness! XXOO!! Loved your popsicles block first time round and so happy to see it as your first BOM for Superbuzzy! We have no need for ice lolllies here, only umbrellas and boats! I have never seen melon lollies in the UK either but I wish I had- I love melon! I love the Popsicles. We call them ice blocks in Australia. I like the sound of Popsicles better. Your blocks are so cute. I think I will have to join this qal even though I don't have the time. I'm telling my self it's just one block a month I can squeeze that in. love how you've done the 3-d effect on the chocolate one! Congratulations Ayumi! What an amazing collaboration idea. If I was a neighbour of the shop I would absolutely take the class because it is on MY birthday!! Your popsicles block is one of my favorites that you've made - so unbelievably creative! I hope that you get some relief from the heat soon. Summer has finally come to Vancouver and I must say I am really enjoying the sunshine. We are lucky that we don't have the humidity. Hi Katy! I'll be sure to blog about my new pattern as soon as it is available at superbuzzy in the beginning of the month from now on ;) Thank you Katy! Such cute blocks. They look so complicated. Oh Ayumi! I am so happy for you! This is wonderful. Will they just be available for that month? or in sept. will we be able to get, say, the past months? Hi Jane! That is a great question! As far as I know, it will be always available at superbuzzy, so if you decide to go ahead and paper-piece some popsicles in September, the pattern should be available for you at superbuzzy. Thank you for asking a great question, Jane! Oooh, thank you again Ayumi for letting me play with your pattern. I have a confession to make. I told you this is my first time trying out paper-piecing. But what I really meant to say is, this is my first time trying this particular paper-piecing method used to make your pattern. I didn't mean to mislead anyone especially you, Ayumi. I have used foundation paper-piecing before but with the top piecing method on paper foundation sheet. The fabric is placed on top of the printed pattern of the foundation sheet with the seam allowance already drafted into the pattern. I was a bit gun-shy using the more common method (fabric placed underneath the paper with the pattern facing up) because I thought it was too complicated. So for the first time, I took the courage to just go for it. And guess what?! It wasn't scary at all! As a matter of fact, I had fun! To all the newbies out there, don't let your misconceptions about paper-pieicing stop you from trying. I hope you'll enjoy it as much as I did. I mean c'mon, lookit! How can anyone resist yummy popsicles and adorable penguin?! Stinken' cuuuute! i'm SO excited for this pattern, Ayumi!!! Why don't we have cute watermelon popsicles like that in the states? sooo cute!!! I'm so excited to try out your pattern! You did such a wonderful job!!! 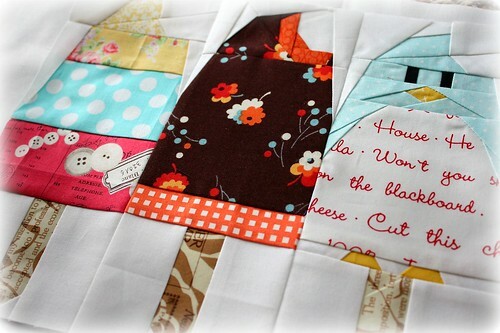 I just placed my order from super buzzy and will make your adorable block ASAP!!! Your popsicle pattern is adorable but what I find so funny is your husband's attitude about your popsicles! You see I thought I was the only woman in the world with that problem. My husband has the same attitude. Thank you for sharing. I makes me feel more normal. Also, I'd never heard of watermelon popsicles, but I bet I would love them! the cutest pp pattern ever!! I'm making a new valance for my kitchen to alternate with my pop bottle curtain. Thank you for the great pattern Ayumi! Ayumi - so happy that you are making your work available - I am a fan! You have a lovely sensibility and much talent and I look forward to many more patterns! P.S. 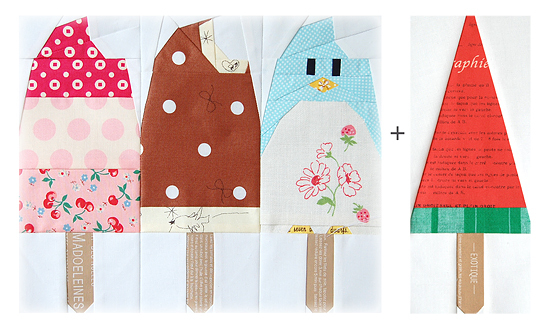 I pieced up my first Ayumi popsicle last night and blogged it - ADORABLE! Thank you. You're a inspiration for me! Ayumi, your popsicles are adorable!! It is exciting to see newer version of your popular pattern.. the little penguin is genius! Oh no! Just stayed five days in Oak view close to Ventura! Came all the way from Germany and did not know about that store... to bad! Maybe next time! I love these Popsicles! Thanks so much for providing the pattern for us. I just finished the download and I can't wait to make some. Parabéns, tudo que você faz é lindo! I love these blocks! It appears that superbuzzy is no longer a functioning site. Are these patterns available elsewhere for purchase?